A new report from the American Meteorological Society makes a rather stunning statement about climate change. For the first time, researchers have concluded that specific weather-related events could not have happened without the influence of climate change caused by human activity. Three events studied in 2016 were so extreme that they did not fit into the context of natural climate conditions, according to researchers working on separate projects. One involved the global heat record for 2016; another was focused on warmth across Asia; and the third was the “blob” of warm ocean water familiar to folks who follow weather in the Pacific Northwest. A “blob” of warm water off the Northwest coast from 2013 to the end of 2016 could not have occurred without human-induced climate change, experts say. Personally, I did not expect to see this sort of demonstrable statement about man-made climate change anytime soon. In classes and seminars on the subject of climate change, I’ve often seen lecturers present frequency curves that show the number of times that certain weather-related phenomena — such as temperatures or rainfall — are observed over a given time. We’re told by climatologists that many of these curves are steadily shifting, so that fairly extreme conditions occur more often and truly extreme conditions emerge for the very first time in certain locations. Researchers are loathe to say that a given storm, drought or hurricane is the result of climate change. They would rather say climate change affects the likelihood of extreme weather events, plotted at the end of the frequency curve. In the realm of statistics, there is a tendency to hold onto the idea that almost any kind of weather could occur almost anytime, provided that a perfect storm of conditions line up together. Against that backdrop, comes the new report titled “Explaining extreme events of 2016 from a climate perspective,” which examines extreme weather events throughout the world. “First, it is important to note that climate scientists have been predicting that … the influence of human-caused climate change would at some point become sufficiently strong and emergent to push an extreme event beyond the bounds of natural variability alone,” state the six editors in an introduction to the report. In other words, the conclusion comes from computer models that can analyze the probability of an extreme event taking place when greenhouse gases are found at different concentrations. Results using today’s observed conditions are compared with results using conditions before the industrial release of greenhouse gases. In the three highlighted papers, the researchers calculated the “fraction of attributable risk,” or FAR, for the extreme event they were studying. FAR is a statistical approach used in epidemiology to measure the likelihood of an event under various conditions. For explanations, see Boston University School of Public Health and the 2007 IPCC report. “All three papers concluded that the FAR was 1, meaning that the event was not possible in the ‘control’ planet and only possible in a world with human-emitted greenhouse gases,” the editors say. Although this is the first time that researchers have concluded that extreme events could not have happened without human-induced climate change, the editors are quick to point out that the same phenomenon may have occurred unnoticed in the past on a smaller geographic scale. These findings do not mean that the climate has reached any kind of tipping point. It simply adds to the evidence that mounting weather extremes are not the result of natural processes. Reporters Brad Plumer and Nadja Popovich of the New York Times do a nice job of delving into the concept of attribution science while mentioning five of the extreme events covered in the new report. They quoted Heidi Cullen, chief scientist at Climate Central, which produces news stories about climate issues. “In 2011, people were still of the mind-set that you couldn’t attribute any individual event to climate change,” Cullen said. “But with each subsequent issue (of the BAMS report), people are able to say that climate change really is increasing the risk” that extremes will occur. Climate-change skeptics frequently bring up a 40-year-old story about climate change — a fleeting notion that the Earth was cooling. Talking about that story, which was picked up by Newsweek and other publications, serves as a roundabout way for skeptics to ridicule the science of global warming, suggesting that scientists have never been able to get their story straight. But the idea of global cooling failed to stand up to scientific scrutiny, and the whole idea of global cooling soon disappeared. Now is the time to put that old story to rest, writes Peter Dykstra, publisher of the nonprofit Environmental Health Sciences, in a guest blog published on the Scientific American website. “Rush Limbaugh is a frequent flyer on the Newsweek story, making the common error of promoting it to a ‘cover story.’” Peter writes, noting that it was a single-page, nine-paragraph piece on page 64. Peter goes on to describe how various people have used the story to sew seeds of doubt about today’s leading climate-change findings. Ironically, current research predicts that we will see increasing weather anomalies as a result of climate change. Studies also show that soot is unintentionally landing on the polar ice caps, melting them even faster. On the other hand, thousands of studies have now documented the warming trends in correlation with an increase in greenhouse gases. If anyone doubts the level of climate-change research taking place, take a look at “Science Daily,” a website that compiles reports on all kinds of studies. The category “Climate” includes just a portion of the climate research underway throughout the world. 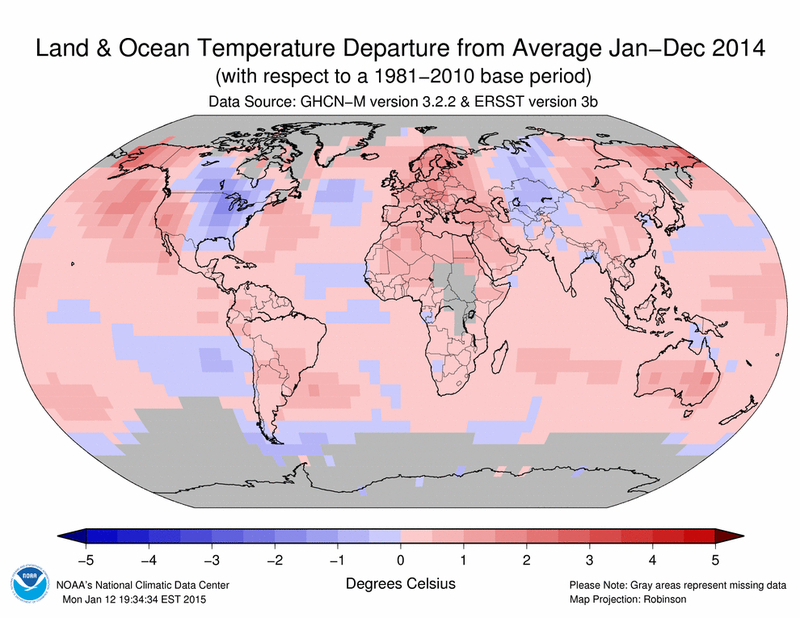 Some people apparently are skeptical about whether 2014 was actually the warmest on record. They cite probabilities provided by government researchers to support their skepticism. But at least some skeptics seem confused about the meaning of this statistical uncertainty. At the end of the day, the discussion about a single calendar year obscures the more important long-term trend of warming air temperatures, warming and acidifying oceans along with melting ice sheets, all of which are hallmarks of manmade global warming. Including 2014, 13 of the top 15 warmest years have all occurred since 2000. Last year turns out to be the hottest year on record for the Earth’s surface, according to climate researchers who analyzed average temperatures across the globe. The year 2014 adds yet another dramatic page to the record book, which now shows that the 10 warmest years since 1880 have occurred since the year 2000 — with the exception of the record year of 1998, which now stands as the fourth warmest on record. The data were released this morning, with additional information provided in a telephone conference call with scientists from NOAA — the National Oceanic and Atmospheric Administration — and NASA — the National Aeronautics and Space Administration. The two agencies conducted independent analyses of their data, coming to the same conclusion about the record year of 2014. Across the Earth, the average temperature in 2014 was 1.24 degrees Fahrenheit above the annual average of 57.0 degrees F, with records going back to 1880. That breaks the previous records of 2005 and 2010 by 0.07 degrees F. It’s also the 38th consecutive year that the annual global temperature was above average. Since 1880, the Earth’s average surface temperature has warmed by about 1.4 degrees Fahrenheit, mostly driven by an increase in carbon dioxide and other greenhouse gases released into the atmosphere, the researchers said. Most of the warming has come since the 1980s. Although some skeptics have raised questions about whether global warming has been occurring in recent years, Schmidt said any short-term pause does not change the overall trend. In fact, the temperature rise seen for the past year fits perfectly onto a graph of the decades-long trend line for temperature rise. 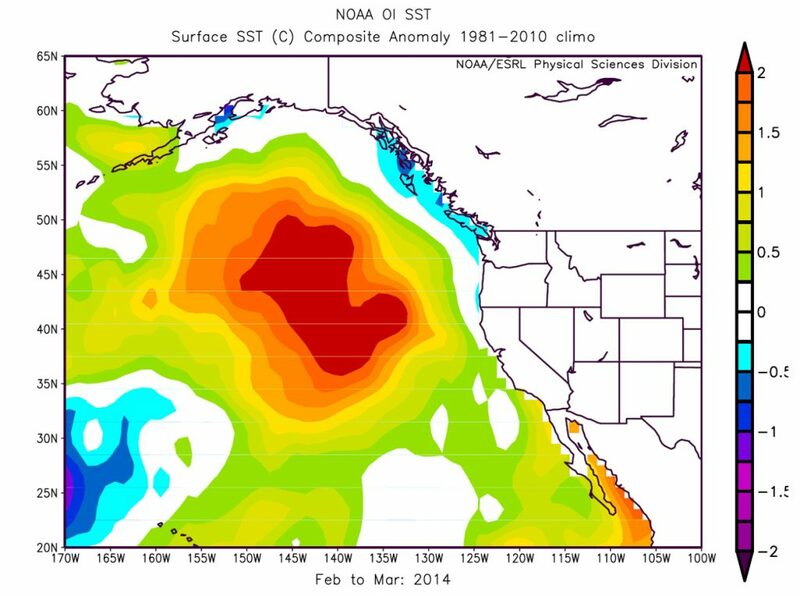 Ocean conditions such as El Nino or La Nina can affect temperatures year-to-year, Schmidt said. Since these phenomena can cool or warm the tropical Pacific, they probably played a role in temporarily “flattening” the long-term warming trend over the past 15 years, he added, but last year’s record-breaking temperatures occurred during a “neutral” El Nino year. This past year was the first time since 1990 that the global heat record was broken in the absence of El Nino conditions during the year. If El Nino conditions are present at the end of 2015, the researchers said the chances are high that the record will be broken again this year. As I mentioned in yesterday’s post in Water Ways, strong regional differences were seen last year in the contiguous United States, with several western states experiencing record highs while the Midwest suffered through an abnormally cold winter. 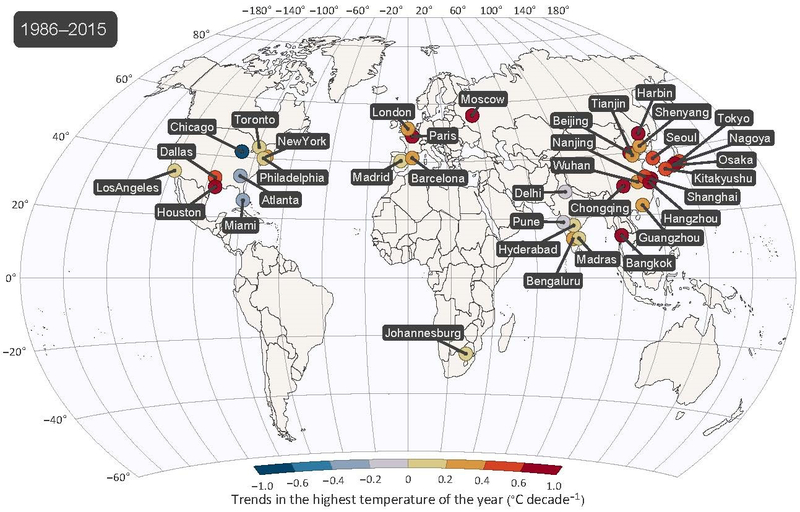 Other cold spots can be seen on the global map, but the hot spots more than balanced them out to break the heat record. Much of the record warmth of the Earth can be attributed to record heat accumulated across the oceans. The average ocean temperature in 2014 was 1.03 degrees higher than the longterm average of 60.9 degrees, breaking previous records set in 1998 and 2003. Record months for ocean temperatures were seen from May through November, with January through April each among the all-time top seven, while December was the third warmest December on record. The all-time monthly record was broken in June of last year, then broken again in August and again in September. Such sustained warmth in the ocean has not been seen since 1997-98 — during a strong El Nino. 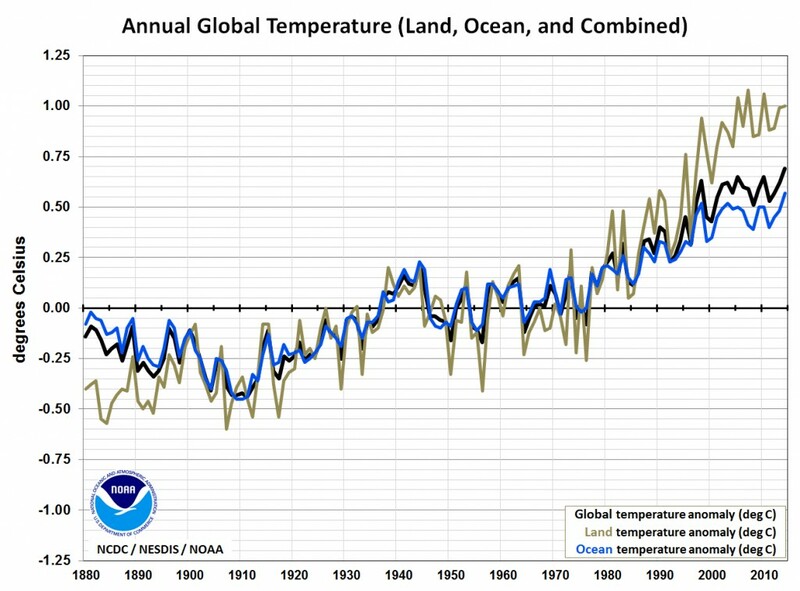 On the land surface, the average temperature was 1.8 degrees higher than the long-term average of 47.3 degrees F, or the fourth highest average land temperature on record. Europe is expected to report that 2014 was the warmest year in at least 500 years, according to information from the World Meteorological Organization. Last year surpasses the previous record set in 2007. Much of that warmth can be attributed to the second-warmest winter on record, followed by a record-warm spring. According to the WMO report, 19 European countries have reported or are expected to report that last year was their hottest year on record. They Austria, Belgium, Croatia, the Czech Republic, Denmark, France, Germany, Hungary, Iceland, Italy, Luxembourg, The Netherlands, Norway, Poland, Serbia, Slovakia, Slovenia, Sweden, and the United Kingdom. Around the world, precipitation was near average for 2014, the third year that near-average precipitation was measured for land-based stations. GISS Surface Temperature Analysis from NASA. An ultra-high-resolution computer model ties weather into greenhouse gas emissions, and the resulting animation shows whirling and shifting plumes of carbon dioxide and carbon monoxide. Ultimately, the greenhouse gases disperse into the atmosphere, increasing concentrations across the globe and contributing to global warming. It’s almost too complex to comprehend, but it is a fascinating process. As you can see from the video, carbon dioxide levels are more significant in the Northern Hemisphere, where the emissions are out of phase with the Southern Hemisphere. That’s because the seasons are opposite, with the maximum growth of vegetation taking place at different times. The reds and purples are the highest concentrations of carbon dioxide. The dark grays denote the highest levels of carbon monoxide, caused mainly by large forest fires. The animation was produced with data from measurements of atmospheric conditions plus the emission of greenhouse gases, both natural and man-made. The simulation, called “Nature Run,” covers a period May 2005 to June 2007. Engineers can use the model, called GEOS-5, to test satellite observations. In July, NASA launched the Orbiting Carbon Observatory-2 (OCO-2) satellite to make global, space-based carbon observations. The additional data will add to Earth-based measurements. See also OCO-2 Mission Overview. According to studies, last spring was the first time in modern history that carbon dioxide levels reached 400 parts per million across most of the Northern Hemisphere. Concentrations are continuing to rise, mainly from the burning of fossil fuels. Levels were about 270 ppm before the Industrial Revolution. The GEOS-5 computer model is being used in tests known as Observing System Simulation Experiments (OSSE), which can help satellite observations tie into weather and climate forecasts. For more detailed views involving various parts of the world, see “A Closer Look at Carbon Dioxide” on NASA’s website for “Orbiting Carbon Observatory 2.” For information about modeling, visit the website of the Global Modeling and Assimilation Office. Ocean acidification is hitting Washington’s shellfish industry even before we begin to experience the full effects of climate change, and Gov. Chris Gregoire placed this state in the forefront of action Tuesday when she signed an executive order on the issue. The order supports the findings of the governor’s Blue Ribbon Panel on Ocean Acidification. Check out the story I wrote for yesterday’s Kitsap Sun. The panel released the report during an hour-long presentation of the findings. If you have time, I recommend watching the informative presentation, provided by TVW in the player at right. The executive summary of the report, as well as the full report, its appendices and the governor’s order, can be downloaded from panel’s webpage on the Washington Department of Ecology website. Gregoire’s order is considered the first state-level action on ocean acidification — and that has attracted attention from across the country. For example, stories were written by environmental reporter Juliet Eilperin of the Washington Post and by Virginia Gewin of Nature magazine. Ocean acidification has been called the “evil twin” of global warming, because the effects can be more swift and more severe than gradual warming of the Earth. That’s not to discount other serious effects of climate change, including increased frequency of severe storms, sea level rise with increasing flooding, and heat waves with crippling effects on agriculture. But acidification affects organisms at the base of the entire food web. The effects of ocean acidification will not be reversed for a long, long time, even if greenhouse gas emissions are brought under control. The upwelling of old water along the coast brings this problem right to our doorstep now and for the foreseeable future. The shift from coal to natural gas, along with the downturn in the economy, has significantly reduced emissions of carbon dioxide in this country the past couple years, but the levels of atmospheric greenhouse gases continue to go up. “Climate change is taking place before our eyes and will continue to do so as a result of the concentrations of greenhouse gases in the atmosphere, which have risen constantly and again reached new records,” said Michel Jarraud, secretary-general for the World Meteorological Association, in a press release issued yesterday. The WMA reported that the years 2001–2011 were all among the warmest on record, and it appears that 2012 will continue the trend, despite a cooling influence from La Niña early this year. “Naturally occurring climate variability due to phenomena such as El Niño and La Niña impact on temperatures and precipitation on a seasonal to annual scale,” Jarraud said. “But they do not alter the underlying long-term trend of rising temperatures due to climate change as a result of human activities. “The extent of Arctic sea ice reached a new record low. The alarming rate of its melt this year highlighted the far-reaching changes taking place on Earth’s oceans and biosphere,” he added. Environmental correspondent Alister Doyle reported today for Reuters that the United Nations Panel on Climate Change now believes that it is more certain than ever that humans are the primary cause of global warming. In its 2007 report, the panel pegged the certainty at more than 90 percent. Now, it appears likely that the scientists will increase that certainty in the next report in 2013, said Rajendra Pachauri, head of the panel who spoke with Doyle at a climate conference in Qatar. “We certainly have a substantial amount of information available by which I hope we can narrow the gaps, increase the level of certainty of our findings,” he said, adding that analyses also will increase the predicted rate of sea-level rise. Meanwhile, the “Draft National Ocean Policy and Implementation Plan” is still undergoing review by the National Ocean Council. The report contains a chapter called “Resiliency and Adaptation to Climate Change and Ocean Acidification” (PDF 732 kb). That chapter contains some of the same recommendations offered by Washington state’s Blue Ribbon Panel, but the state plan is more specific and comes with a recommended $3.3 million budget to begin work on the problem. U.S. Rep. Doc Hastings of Washington, chairman of the House Natural Resources Committee, is attempting to derail the plan, saying it creates an unnecessary bureaucracy and asserts federal controls not approved by Congress. Read the news release about House action against the plan. I have not talked to anyone on the council lately, but it appears that President Obama’s election campaign over the past year effectively derailed any movement on this issue. In his first press conference after the election, he pledged to jump-start the climate-change effort, but no mention was made of the ocean policy. Review the video below at 42:20. If the world’s leaders were to learn that all civilizations on Earth were going to be attacked by alien beings from outer space, and if they knew they had only a few years to respond, what do you think they would do? Would they search for evidence to show that aliens could not possibly exist, declare the idea a hoax and insist that any defense of our planet would not be worth the cost? Or would they study ALL the evidence, analyze the risks and look for the best way to address the uncertain crisis? Greenhouse warming may seem like an alien concept to some people, but here’s my point: If you run and hide until the aliens have landed, you face a much greater peril than if you face the problem in a practical way. Now I’m all for discussing the many uncertainties — such as how high ocean waters may rise under various assumptions. But please don’t tell me that some basement scientist has disproved the idea that temperatures are rising or has shown that humans could not possibly affect the Earth’s climate. Here’s what I’m wondering: Would those who turn their backs on climate change act the same way if the entire Earth were under attack from a common enemy? Maybe our nation’s leaders would be better able to deal with a direct attack, uncomplicated by the uncertainties of science. That’s more than I wanted to say about people who choose to ignore climate change. What I really wanted to write about is the U.S. Navy’s serious approach to the topic, which can provide an example for the rest of us.